Lord Shiva's Archana with Bilva Leaves is the most auspicious way to worship him. By offering Bilva Leaves to Lord Shiva, a person is blessed with good Health, Wealth, Prosperity especially during the Shravan month as per Ancient Vedic Texts. Lord Shiva is the 3rd deity in the Hindu trilogy, along with Lord Brahma and Vishnu. He is the destroyer of all evil, and the one who bestows the greatest blessings when pleased. The month of Shravan is dedicated to Lord Shiva and performing any Pooja and Homa during this month is considered very auspicious and beneficial. The Shrawan Maas ( Month ) is the fifth month in the Hindu Calendar. During this month, the Nakshatra Shravan is the ruling Star on full Moon day and therefore this month has been named as Shravan. This entire month is dedicated to Lord Shiva and worshipping him during this month is said to bring most Auspicious results and blessings of Lord Shiva. By performing Puja Archana during this Shrawan, a person gets good health, wealth and happiness. He is protected from all kinds of Evil effects and Enemies. The most auspicious way of worshipping Lord Shiva is by performing Archana of Bilva leaves, of the Tree known as Bilva Tree. This is a sacred Tree and is very dear to Lord Shiva. A confluence of three leaves of Bilwa Tree is called Bilva Dal which is said to be a representation of Lord Shiva's weapon Trident (Trishul). A Bilva fruit is supposed to be an embodiment and manifest form of Lord Shiva himself. It is believed that all the places of pilgrimage dwell at the base of the Bilva Tree. 2. In the well-known Bilva Ashtakam, a lot has been emphasized about offering even a single leaf of Bilva to Lord Shiva especially during the Shravan month. "Aadityavarne Tapasodhijaato Vanaspatistava Vrukshotha Bilvaha Tasya Falaani Tapasaa Nudantu Mayanta Raayashcha Baahya Alakshmihi"
Oh Goddess Lakshmi, you are as bright as the Sun, the sacred Tree of Bilva was brought forth by your dedicated tapasya. May this Tree remove my internal and external misfortunes and poverty. 4. In Mahalakshmi Ashtotra Shatnama Stotram, Goddess Lakshmi ji has been named as Bilva Nilayam which means the one who resides in the Bilva Tree. Swasti Vachan, Shanti Path, Sankalp, Ganesh Sthapan, Lakshmi Sthapan, Kalash Sthapan, Lord Shiva Sthapan, Navgrah Sthapan, Brahma Sthapan, Agni Sthapan, Invocation of all Gods & Goddesses, Navgrah Mantra Japa (1 mala for each planet), Lord Shiva's Abhishek with Bilva Patras (offered as Archana), Recitation of Rudra Ashtakam for 108 times, Homam with Honey, Ghee, Sugar, Til, Oats ( Jow ), Ashtagandh, Sandalwood powder, Navgrah Samidha and then Lord Shiva's Aarti, Prasad to Brahmins. Kindly select the Duration of your choice by clicking on the Drop-down Option provided above along with the main image. 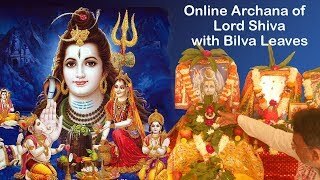 Dates of Online Bilva Patra Archana to Shiv ji will be confirmed to you through an email.